Otto Johann Maximilian Strasser (also German: Straßer, see ß; 10 September 1897 – 27 August 1974) was a German politician and an early member of the Nazi Party. 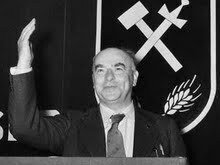 Otto Strasser, together with his brother Gregor Strasser, was a leading member of the party's left-wing faction, and broke from the party due to disputes with the dominant "Hitlerite" faction. He formed the Black Front, a group intended to split the Nazi Party and take it from the grasp of Hitler. This group also functioned during his exile and World War II as a secret opposition group. His brand of National Socialism is now known as Strasserism. Born at Windsheim in Bavaria, Otto Strasser took an active part in World War I. On 2 August 1914, he joined the Bavarian Army as a volunteer. He rose through the ranks to lieutenant and was twice wounded. He returned to Germany in 1919 where he served in the Freikorps that put down the Bavarian Soviet Republic which was organized on the principles of workers' councils. At the same time, he also joined the Social Democratic Party. In 1920 he participated in the opposition to the Kapp Putsch. However, he grew increasingly alienated with that reformist-socialist party's stand, particularly when it put down a workers' uprising in the Ruhr, and he left the party later that year. In 1925, he joined the NSDAP (National Socialist German Workers' Party), in which his brother, Gregor had been a member for several years, and worked for its newspaper as a journalist, ultimately taking it over with his brother. He was focused particularly on the socialist elements of the party's programme and led the party's left faction in northern Germany together with his brother and Joseph Goebbels. His faction advocated support for strikes, nationalisation of banks and industry, and — despite acknowledged differences — closer ties with the Soviet Union. Some of these policies were opposed by Hitler, who thought they were too radical and too alienating from parts of the German people (middle class and Nazi-supporting nationalist industrialists in particular), and the Strasser faction was defeated at the Bamberg Conference (1926), with Joseph Goebbels joining Hitler. Humiliated, he nonetheless, along with his brother Gregor, continued as a leading Left Nazi within the Party, until expelled from the NSDAP by Hitler in 1930. Following his expulsion, he set up his own party, the Black Front, composed of like-minded former NSDAP members, in an attempt to split the Nazi Party. His party proved unable to counter Hitler's rise to power in 1933, and Strasser spent the years of the Nazi era in exile. The Nazi Left itself was annihilated during the Night of the Long Knives in 1934 – in which his brother was killed – leaving Hitler as undisputed party leader and able to pacify both industrialists and the military into accepting his new National Socialist regime. In addition to the "Black Front", Strasser at this time headed the Free German Movement outside Germany which sought to enlist the aid of Germans throughout the world in bringing about the downfall of Hitler and Nazism. Strasser fled first to Austria, then to Prague, Switzerland and France. In 1940, he went to Bermuda by way of Portugal, leaving a wife and two children behind in Switzerland. In 1941, he emigrated to Canada, where he was the famed "Prisoner of Ottawa". During this time, Goebbels denounced Strasser as the Nazis' "Public Enemy Number One" and a price of $500,000 was set on his head. He settled for a time in Montreal. In 1942, he lived for a time in Clarence, Nova Scotia on a farm owned by a German-speaking Czech, Adolph Schmidt, then moved to nearby Paradise where he lived for more than a decade in a rented apartment above a general store. As an influential and uncondemned former Nazi Party member still faithful to many doctrines of National Socialism, he was initially prevented from returning to West Germany after the war, first by the Allied powers and then by the West German government. During his exile, he wrote articles on Nazi Germany and its leadership for a number of British, American and Canadian newspapers, including the New Statesman, and a series for the Montreal Gazette, which was ghostwritten by then Gazette reporter and later politician Donald C. MacDonald. Otto Strasser was permitted to return to West Germany in 1955, after years of being denied entry by the West German government, due to a ruling of the Federal Administrative Court. He regained his citizenship and settled in Munich. He attempted to create a new "nationalist and socialist"-oriented party in 1956, the German Social Union (often called a successor to the 1949–1952, eventually forbidden Socialist Reich Party of Germany), but his organisation was unable to attract any support. For the rest of his life, Strasser continued to advocate for Strasserite National Socialism until his death in Munich in 1974. Otto Strasser claimed he was a dissenting Nazi regarding racial policies. During his later life, he claimed to have actively opposed such policies within the national socialist movement; for example, by organizing the removal of Julius Streicher from the German Völkisch Freedom Party. Hitler tritt auf der Stelle. Oxford gegen Staats-Totalität. Berlin – Rom – Tokio. Neue Tonart in Wien. NSDAP-Kehraus in Brasilien. Die dritte Front, Band 1937,6. Grunov, Prag 1937. Kommt es zum Krieg? Periodische Schriftenreihe der „Deutschen Revolution“, Band 3. Grunov, Prag 1937. Der Faschismus. Geschichte und Gefahr. Politische Studien, Band 3. Günter-Olzog-Verlag, München (u.a.) 1965. Mein Kampf. Eine politische Autobiografie. Streit-Zeit-Bücher, Band 3. Heinrich-Heine-Verlag, Frankfurt am Main 1969. ^ Strasser, Otto. Germany Tomorrow. Jonathan Cape LTD, 1940, p. 11. p. 12.